Well hello there! 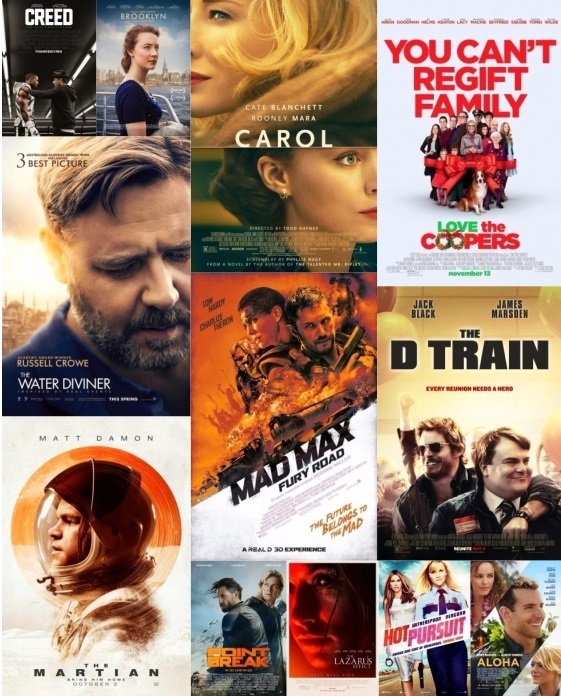 I wound up skipping my Best of 2014 list because when 2015 rolled around there were still too many “2014” movies that I hadn’t been able to catch. Then one thing lead to another…and it was March! So here we are starting the fifth year of this blog! Hard to believe it and boy, does time fly. Below I’ve compiled my list of the best and worst of 2015. At first I was going to do a Top 10 for both because I absolutely had candidates to fill all the slots, but then I decided to stick with five each to truly highlight the best of the best and worst of the worst. As always, I’ve appreciated your feedback, your patronage, and your general presence in my blog. Even if you read this everyday but have never commented or made contact I can still tell you’ve been here and that means a lot. My readership and subscriptions continue to increase every month and it’s all thanks to your word of mouth, likes, and shares. If you haven’t already, make sure to follow this blog, follow me on Twitter (@joemnmovieman), and like my Facebook page so you can help me continue spreading the news about The MN Movie Man. 5. Mad Max: Fury Road – like a lightning rod, the fourth Mad Max film conducted the kind of electricity that could fuel a dozen other pictures. Director George Miller upped the ante for not only summer blockbusters but for filmmaking as a whole with his non-stop action flick that took no prisoners and left most 2015 films in its fiery dust. Starring Tom Hardy but owned by Charlize Theron, this Mad Max signaled the start of the summer season with a rocking battle cry. Truly amazing. 4. Creed – the best unexpected TKO of the year, Creed is really Rocky 7 but don’t let that stop you from entering the ring. Star Michael B. Jordan brings a blistering intensity to the role of a young boxer trying to make a name for himself out from under the shadow of his legendary father’s career. The biggest surprise is original star Sylvester Stallone stepping into the mentor role for his best performance since the original Rocky. Stallone is valiant, vulnerable, and, under the direction of writer/director Ryan Coogler, fairly unforgettable. A champion of a film. 3. Carol – anchored by two of the strongest performances of 2015, this love story between young Therese and married Carol is an achingly beautiful achievement from director Todd Haynes. Delicate as a flower but steely enough to cut deep, it’s a picture about the understanding and acceptance of one’s own desires. Unlike anything else I’ve seen this year, it’s a gorgeous looking film that lingers in the memory long after you’ve left the theater. 2. Brooklyn – the most charming film of 2015, Brooklyn is a sweet love story set against the backdrop of Ireland and New York in the 1950’s. It’s funny, sad, poignant, and delightfully underplayed so that by the time it reaches its emotional climax the tears it wrings from you are well earned. Superbly acted and glowing with grace, it’s a wonderful wonderful period piece. 1. The Martian – the best film I saw in 2015 (twice) is Ridley Scott’s grand space adventure adapted from Andy Weir’s best-selling novel. A full meal of a movie, there’s a little bit of something for everyone here from comedy to action to drama to suspense and even some surprisingly emotional arcs. Powerfully led by Matt Damon and a small army of familiar faces, movies like The Martian are the reason why we go to movies, to be transported and changed. 5. Love the Coopers – arriving like a stale piece of fruitcake, this turkey is reason enough for even the sweetest Christmas fan to say “Bah Humbug”. It’s an obnoxious and lazy attempt at creating a warm family togetherness film with neither the direction nor the performances to help it rise from the sludge. Wasting the talents of its diverse ensemble cast, this is a White Elephant of a yuletide film. 4. Point Break – making the original 1991 film look like High Noon in comparison, this atrocious remake diverts so far from its dopey origins that it should have just ditched the title and shrugged off the obvious comparisons from its detractors. With his unforgivable man-bun, heinous fake tattoos, and not good enough for the Sci-Fi channel acting, Luke Bracey leads the film right off a cliff sans parachute. More focused on being an eco-message film than a heist flick, it sports beautiful cinematography but is overall a lamentable effort. 3. The Lazarus Effect – Kudos to you, Olivia Wilde. You appeared in two of my least favorite films of the year. Beautiful as she is, Wilde just can’t seem to find a film that suits her in the acting department and The Lazarus Effect is a prime example. Barely 80 minutes long, there’s no amount of spiritual help that could raise this one from the graveyard of bad horror thrillers. 2. Aloha– pay no attention to the critics that championed this gigantic turd of a film in 2015…they’ve been blinded by a devotion to a filmmaker that has lost his way. Cameron Crowe’s colossal misfire makes every wrong turn in the book, from casting pale Emma Stone as a Native Hawaiian with a half-Asian father to an inability to assemble a movie that makes any kind of sense. Legendary in its production for going through titles and reshoots like candy, the final product was more of an ‘adios’ to Crowe’s storied status in Hollywood. 1. The Water Diviner – this waste of a film won three Australian Academy Awards. Three. And one of them was Best Picture. Well, turnabout is fair play and I’m awarding Russell Crowe’s directing debut with Worst Picture of the year honors. An interminable slog through an incomprehensible plot and ridiculously banal performances, I was praying for some sort of divine intervention to cut the screening short. It’s bad from the moment it starts until it releases us from our agony. Hot Pursuit – Ok, so I’m not going to sit here and waste my time telling you that Hot Pursuit is a good movie because it’s fairly derivative from countless other female buddy pictures, too broad for words, and in the end is an inconsequential blip on the careers of stars Reese Witherspoon and Sofia Vergara. Where I took issue was how the movie was dragged through the grime by critics that would laud the same type of movie had it been released with males in the leading roles. People took actual offense that Witherspoon went from an Oscar nominated turn in Wild to something so lightweight as Hot Pursuit and I kinda just wanted to tell ‘em all to scoot up a tree. The film plays right into the strengths (and assets) of both leading ladies and is ultimately harmless. It’s not great entertainment, but it’s not the garbage mess that people would have you believe. The D Train – I’m a die-hard anti-Jack Black fan but even I had to admit that The D Train was one of the more unexpected small victories of 2015. Black is winning as a lovable loser running his class reunion that makes a bid to get a famous-ish classmate to attend. Flying out to California to convince the guy (James Marsden) to make an appearance, the film takes an unanticipated turn that audiences just won’t see coming. The film has a dark charm and strong performances to justify your seeking it out. I think you’ll be surprised…I was. Where I Saw the Most Movies: Showplace ICON – 66!